Sequoia & Kings Canyon National Parks: Kings Canyon Version. It is definitely worth saying that Sequoia & Kings Canyon National Park are technically one place, however, they are at the same time two separate places offering very different landscapes, sites, and amenities. If you were to start in the Foothills of Sequoia and drive up Generals Highway you would eventually find yourself exiting the park boundaries miles beyond Lodgepole Visitor Center and entering the Jennie Lake Wilderness; from here you will enter the national park grounds again around Quail Flat and Montecito Sequoia Lodge where you will be in Kings Canyon National Park specifically. Now, to get to the section of Kings Canyon we explored you would need to continue North East onto 180, through winding cliff sides in the Monarch Wilderness before reentering Kings Canyon National Park at Cedar Grove Visitor Center just beyond Grizzly Falls. This stretch of Kings Canyon National Park is often known as Roads End. The drive along 180 will be one of the most breathtaking in your life; I’m sure of it. Have your best and least distracted driver behind the wheel. The barren, rocky outcroppings are absolutely stunning. There are multiple pull-offs and even trailheads (multiple waterfalls) to stop and enjoy the Canyon along the way so plan to stop. Take care to fill up your car with gas before embarking on this adventure; we stopped at Hume Lake for a few necessities on our way through and a quick fill up. We arrived in late afternoon and the Cedar Grove section of the park was empty. Hundreds of first come first serve campsites between the four campgrounds (Sentinel, Sheep Creek, Moraine and Canyon View) were available, and many for a mere $18 a night. It is HOT with moderate coverage in the canyon, so we found ourselves the shadiest spot we could to set up our gear before slathering on sunblock and heading further down the road to the Roads End Permit Station where many trails begin. Please note, the first section of Kinga Canyon National Park, Grant Grove, has additional accommodations as well. Campgrounds include Azalea Campground, which is open to tents, RVs, and trailers year-round, Sunset Campground, which is open to tents, RVs, and trailers from early spring through late fall, and Crystal Springs Campground, which is open to group camping for tents, RVs, and trailers from early spring through late fall. If camping in a tent or RV isn’t quite your style, the beautiful John Muir Lodge is the pinnacle of Kings Canyon lodging; open year-round in the Grant Grove Village, offering 26 hotel rooms and a restaurant this stone-and-timber retreat is luxurious. Grant Grove Cabins and the Grant Grove Lodge are also available just .5 miles from Sequoia Grove, the visitor center, market, restaurant, gift shop and post office. You can make reservations online or call (877) 436-9615 for any of the above mentioned. Trail suggestions are listed below and ranked in difficulty from Easy to Challenging. DESCRIPTION: A very short, shady, paved walk to a powerful waterfall rushing through a granite chute. About five minutes of walking will provide you with a beautiful view! DESCRIPTION: This famous rock is where John Muir used to stand to give talks to visitors in Kings Canyon. It not only offers beautiful views of the South Fork of the Kings River but a great place to jump in and swim! As always, use your best judgment when entering the water; this is a strong river especially in May, June, and early July. Heed all warnings. DESCRIPTION: This incredibly easy 1.5-mile trail passes high granite walls, lush meadows, and the Kings River. Trailhead parking is 4.5 miles east of Cedar Grove Village road toward Roads End. From the parking area, over the bridge, and to the boardwalk, the river washed away hardened surfaces, so some spots are now more difficult for wheelchair travel. DESCRIPTION: Two miles out and back right off of Generals Highway. Beautiful wildflower filled switchbacks leave you to a rocky summit with a 360-degree view. We pulled over shortly after entering the Grant Grove Area coming from Sequoia National Park and completed this hike in about an hours time. There isn’t much tree cover on this hike either so on a hot, summers day be sure to have your sun protection available! DESCRIPTION: This sandy trail follows the glaciated South Fork Canyon through forest and desert-like terrain, past an impressive show of rapids and cascades, to one of the largest waterfalls in Sequoia and Kings Canyon National Parks. A day hike for the books, you’ll enjoy the close proximity to the thunderous Kings River, the cool coverings of cedars and ponderosa pines, the stunning views down canyon and finally a thorough soaking from mist falls. The first part of this 9-mile round trip is relatively flat; during the last mile to the falls, the trail gains 600 feet. The average time for this trip is 4 to 5 hours, however, we hauled @$$ and finished the hike in about 3 hours and 10 minutes. Mist Falls itself isn’t actually all that exciting (personal opinion), it’s buggy and misty, however, the hike to the falls is absolutely stunning. One of the coolest parts was to hike through such different terrain from start to finish; it will be hot and dry to begin your hike (in the summer months) but as you climb in elevation and tree cover you will start to cool down so bring some extra layers along. DESCRIPTION: 17.3 miles out and back so it is most often done as an overnight or a double overnight. You will hike right on up past mist falls on this journey as well so you will experience all of the wonders of the above-mentioned hike! They say the real climbing and the best views occur just after Mist Falls. At Mist Falls the trail begins to gain elevation and will become more difficult; don’t forget to stop and look back at where you came from because the views of the Canyon get better with every step. At about mile 6 you will encounter campsites, this is a great place to turn around or for some, their destination if staying the night or completing the Rae Lakes Loop. If you are backpacking on this route, you will pick up your permits at the Roads End Ranger Station and the start of this trail. The NPS typically reserves about 40% of its permits for walk-ups, but you would be advised to get here early, as anything along the Rae Lakes Loop is very popular. The station is open from 7:00 AM to 3:45 PM. Don’t forget to turn around and enjoy the view on your way up! DESCRIPTION: Beyond Sheep Creek, using the Don Cecil Trail, the climb to Lookout Peak provides an incredible panorama of the park’s backcountry. This strenuous, all-day hike is 13 miles round trip and climbs some 4000′ to the summit. It is worth it though! You will have a splendid view looking right down into Kings Canyon, similar to the view you get of Yosemite Valley from Glacier Point. However, unlike Glacier Point, chances are you’ll have Lookout Peak all to yourself if you visit. Judging by the number of people we came across in this park in early August, it is severely under looked, but that’s the beauty of it! Much less busy than its neighboring parks Sequoia National Park and Yosemite National Park. This allows you more opportunity to enjoy the natural world in it’s more natural state. Known as the ‘backpackers’ park, Roads End is a popular spot to enter the High Sierra. Coming from the East Coast where the park we most frequent, The Adirondacks, is massive but not a national or state park due to communities existing within the 6 million acres, we’re used to back country camping. Kings Canyon at Roads End felt the most like home to use with its rough terrain and lack of tourists! View of the Kings River as you drive deep into the canyon towards Roads End. 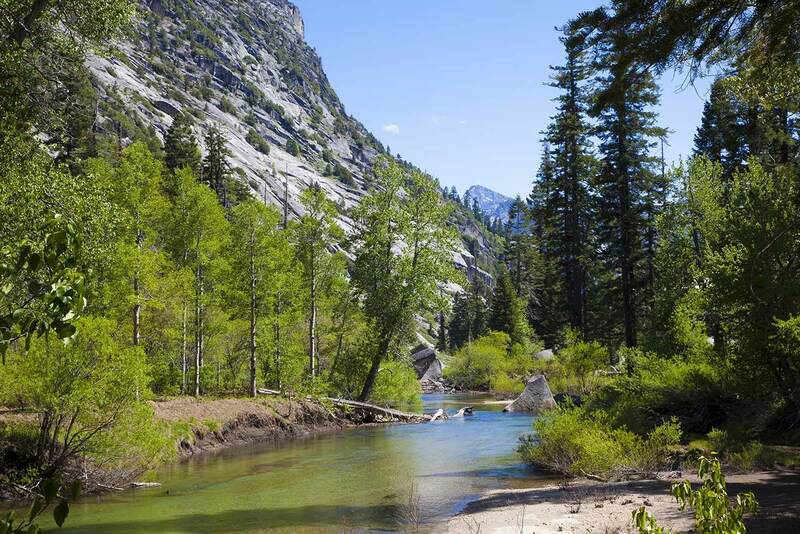 Planning your stay at Kings Canyon National Park? PIN ME! My heart is bursting looking at these pictures, I want to visit here so badly! I got a good laugh at the recommendation to pick the “best and least distracted driver”, my boyfriend always drives but he gets so distracted by the scenery! Maybe I will have to do the driving when we finally get to spend time at this park, to ensure our safety… Thanks for the info on the trails, I’m excited to check them out! Hahaha, seriously around every bend is a new, beautiful vista! Enjoy your trip when you go it is AMAZING. Wow, such a great write-up on all the trails, did you get to do all of those? Either way, glad to have this to refer to if/when I get out there! Sometimes, I prefer to do a bunch of shorter, easier hikes to see a lot of different parts of a park, others I’m in it for a long haul. Like you said, a total hidden gem! I didn’t get to lookout peak but did the others! Absolutely loved this. Definitely adding this one to the bucketlist. Its absolutely beautiful. Thanks for sharing all the amazing tips and advice. This sounds like the most amazing, soul cleansing trip. I would love to do this someday! Sounds like an amazing hiking and camping experience, let’s just say I need to start planning on going on such trips for the benefits of my health and just to travel. Thanks for reading! & it is. absolutely beautiful and so much fun!! The places you share are incredibly beautiful. Sometimes, those of us that live in cities forget how beautiful the nature is. Thank you for sharing and reminding of it. haha you aren’t kidding! it was unreal. I’ve always wanted to visit Kings Canyon. I love the way you described each trail by difficulty. Makes it so easy to choose which ones to go on. I loveeee hiking! Hope you find one you love!! I have been to a number of National parks, especially when i was younger and my parents took me, but never to this one! I would be really interested to go as an adult and experience nature! We’ve never gone hiking in the States yet but definitely would love to! I always get an itch to get outside and hike or snowshoe after a week of city life! Oh my gosh the views are amazing. I’ve never been to that part of the country and hope to go someday. Great photo opps too. I love hiking and this national park would be a perfect choice for me to go hiking for a week. The views are absolutely stunning and it’s great that there are choices for every type of hiker and not all trails are difficult. We definitely love to hike. Looks like a place we should go to as a family. I’ll keep it in mind. I actually enjoy camping or going on an RV adventure with the family. I’m loving the views in this National Park. We are planning a trip to Sequioa in the summer with the whole clan (grandparents and children hehe). As much as I would love to go hiking I couldn’t but we’ll surely plan a hiking trip soon. Thanks for sharing! You took beautiful photos! I have a post on Sequioa as well if you’re interested! Enjoy the trip. it’s BEAUTIFUL! Although I don’t leave near these trails, I know some people who would love to go check them out. Beautiful shots. Wow what a hike! Your photos are amazing, it really does look like an amazing trek, I would love to go! Looks like experience. Never been to such hike before in our country but I would love to do it someday hopefully this year. Would also love to visit this place someday! That’s awesome that you saw a rock where John Muir used to give talks. I can only imagine how cool it must have been to see him speak there.